This is a little late for Thanksgiving, but trust me it will come in handy for next year. 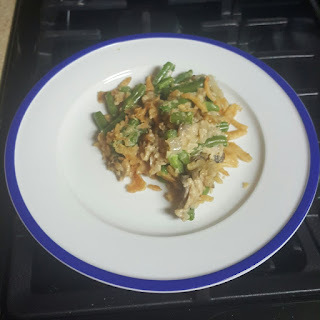 A few years back, I was trying to avoid eating canned items and realized I really didn't like the traditional green bean casserole that would appear each year at Thanksgiving. Don't get me wrong, I like green bean casserole, I was just looking to improve upon a good thing. So I looked up a few recipes and set out to create my own homemade green bean casserole. Boil water in a large pot. Wash the green beans and cut the ends off. I usually cut the green beans in half to make it easier to serve later. Cook green beans in the boiling water for 4 minutes. Drain the water out and set the green beans aside. In a large skillet, sauté the garlic and shallots in the butter over medium-high heat. Add the mushrooms and stir. Add salt and pepper to taste. Once the mushrooms begin to cook down and release their juices, add the heavy cream, chicken broth, and dry white wine. Reduce heat to medium so the cream doesn't scald. Let the mixture cook together and reduce. Sprinkle in enough flower to thicken the sauce. This will keep it from settling on the bottom. Combine the mushroom sauce with the green beans in a baking dish. Coat the top with French fried onions. Bake for 30 minutes at 350 degrees. If you are feeling adventurous, try making your own fried onions. The recipe can be found here.